For Australia’s oldest PhD graduate Dr David Bottomley, learning is a life-long journey. 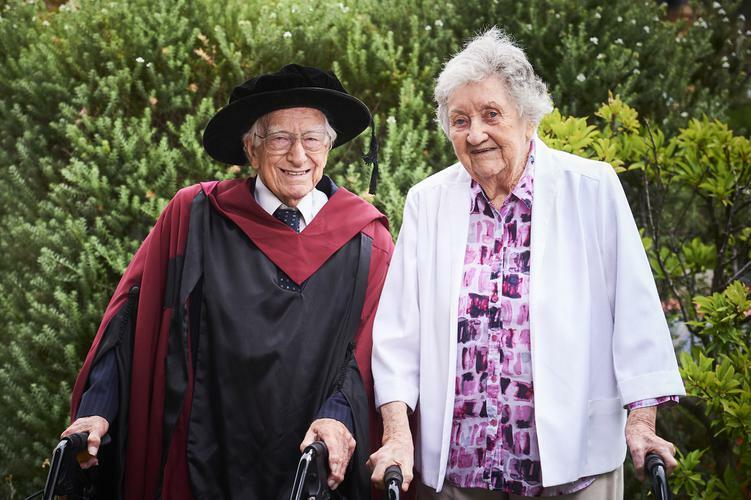 The 94-year-old graduated from Curtin University earlier this week with a Doctor of Philosophy after completing his thesis, which examined the teaching methods of five progressive English educators who introduced an understanding of science into the curriculum from 1816 to 1885. Curtin University Vice-Chancellor Professor Deborah Terry congratulated Dr Bottomley on completing his PhD and recording his place in the history books as Australia’s oldest recorded PhD graduate. “Dr Bottomley’s incredible achievement shows age is definitely no barrier to furthering your education and his graduation will be an inspiration to many,” Professor Terry says. Dr Bottomley, a Melbourne-based father-of-four, grandfather to 13 and great-grandfather to one, says he completed his PhD part-time and finished in seven years – a year ahead of schedule. “The first feeling I had was one of relief and utter numbness – I think that’s a feeling shared by most postgraduate students after any big exam or assignment,” Dr Bottomley says. And even though he intends to make use of that by going to the cinema, taking walks in the park and spending more time with his wife, Anne, of 68 years, Dr Bottomley already has plans to continue his education studies. “I’m already looking at more ways to apply and improve my basic skills, and hopefully help stir the creative pot,” he says. “I believe the ideas of the headmasters I studied are worth repeating today in order to instil that creativity and sense of learning in the next generation. Dr Bottomley said he wanted to complete his PhD at Curtin in order to work with John Curtin Distinguished Professor David Treagust, from Curtin’s School of Education, who supervised his thesis, titled ‘Science, Education and Social Vision of Five Nineteenth Century Headmasters’. “To me, education is something you live in; it’s a life force as (Nobel Prize in Literature 1925 recipient) George Bernard Shaw might have called it,” Dr Bottomley says. Starting his career as a science master at an Albury, New South Wales school in 1946, Dr Bottomley then worked in social and market research across England, Australia and Asia for 60 years before completing a Masters by research degree at the University of Melbourne.